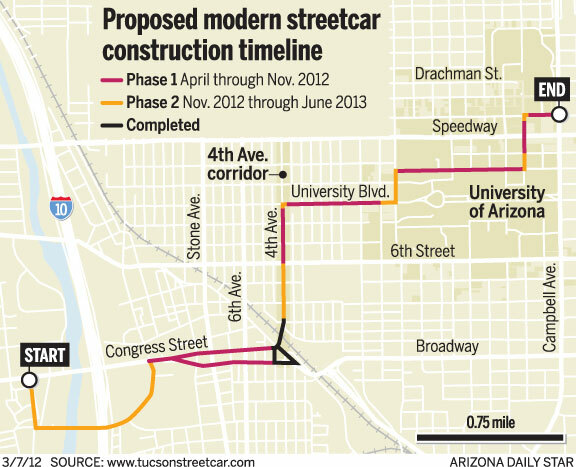 Tucson is about to embark on a 475-day construction project to build a modern streetcar that will span 3.9 miles and have 17 stops. Here's what you need to know about the construction process. The first phase begins in April and the second phase will begin sometime around November. Each phase is estimated to take eight months and the first one will be mostly complete by the fall. The first phase includes most of the route from Helen Street to part of Fourth Avenue and then also Broadway and part of Congress Street downtown. Some sections in between are not included in the initial phase because precurved track is required and it is difficult to get that material early on in the project. Those areas are part of Phase 2. Will it affect the Fourth Avenue Street Fair? No. Construction is set to start after the spring fair and special considerations will be made for the winter event. How will it affect the University of Arizona campus? The Warren Street Underpass will close in April. The Olive and Highland underpasses will remain open. Some areas will be converted to two-way traffic. All of Second Street from Campbell Avenue to Mountain Avenue will be two-way. When construction begins on Second Street, First Street will become two-way and will stay that way to ease congestion. How will it affect traveling downtown? Construction on Broadway and Congress Street will be at night, most likely from 7 p.m. to 5 a.m. The plan is to try and keep two lanes of Broadway open during the day. Congress, however, could face closures. When will streetcars start running? During Phase 2 there will be a test track on Fourth Avenue where cars will be running. The actual service will be available in late 2013.